Audacious Inquiry is proud of our team-member Genevieve Morris, who was recently named by Health Data Management as one of the Most Powerful Women in Healthcare IT. Ms. Morris has been with Audacious Inquiry since 2011 and has since been a key asset to supporting the company’s clients through her subject matter expertise in health IT policy, Interoperability, Meaningful Use, and the Quality Payment Program. Her insights have informed decisions at the statewide level up to a nationwide scale, which will have a lasting impact on health information exchange regulations and policy and policy for years to come. In addition to her leadership of the projects mentioned above, Ms. Morris was the lead author of a report developed for the ONC titled, “Patient Identification and Matching Final Report”. The findings from the report have been widely referenced by both The National Association of Healthcare Access Management (NAHAM) and the ONC. NAHAM applied this research into the development of best practices for data registrars and ONC subsequently built certification requirements into the 2015 Edition to ensure standardized demographic information is sent in every C-CDA and to develop best practices and training modules for registrars and provide practices. “It is an honor to receive this recognition from a well respected industry publication, and be in the company of other accomplished women who I admire,” Genevieve commented. 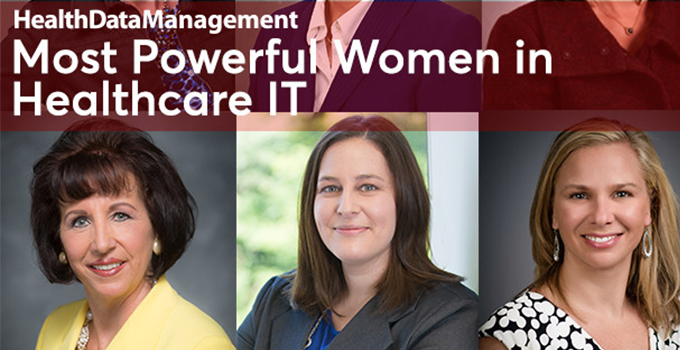 In total the Most Powerful Women in Healthcare IT list is comprised of 75 leaders who were recognized across the following categories: Healthcare IT executives working at healthcare provider organizations; Healthcare IT thought leaders, and Healthcare IT vendor executives. Join us on May 17th at the Women In Healthcare IT Conference in Chicago to celebrate all the women who made the list and discuss what trends and advances in healthcare IT lie ahead.